Last year Playmobil embarked on its first foray into licensed toys with a line of figures and playsets based on the original Ghostbusters. This year the plastic paranormal exterminators trade their tan jumpsuits for the dark gray gear of Ghostbusters II. It looks good on them. Peter Venkman, Ray Stantz, Egon Spengler and Winston Zeddemore, decked out in Ghostbusters II gear. Just the four of them, no new vehicles or elaborate playsets. Instead, each of the figures comes with a special transparent inverted pyramid piece used in conjunction with a smartphone app to activate a “Playmogram” gimmick. The pyramid perches atop one of the Ghostbusters’ signature traps, then placed atop a phone running the Playmogram app. Turn the lights down low, and various ghosts appear to be caught in the trap. The effect is slightly more impressive in person. It’s not an effect that’s easy to photograph, unless you’re a wizard. The trapped ghosts howl and grunt comically. Pressing a button in the app activates an animation of the spirits being sucked into the trap. It’s a silly gimmick, but it’s kind of cute. Not as cute as Winston with his slime thrower. Ghostbusters II swapped the green slime of the original film with reddish-pink psychomagnotheric slime, AKA mood slime. While the rest of the figures get standard issue proton packs, Winston is rocking the special pack used to coat the Statue of Liberty with goo in the film’s climax. The slimed becomes the slimer. Wait. By virtue of having the coolest backpack of the bunch, Winston Zeddemore is my favorite, but Ray Stantz is a close second. A god-damned American hero right here. Playmobil figures aren’t great on portraying things like facial features, but all this figure needs to be Dan Aykroyd is a cigarette dangling from his mouth. I might be exaggerating a bit. Maybe it’s just those awesome Ecto Goggles getting to me. The goggles, they do nothing. Ray here is a really good example of Playmobil’s relative attention to detail. You can look over his shoulder and help him monitor P.K.E. valences via his handheld monitor, connected to the goggles via a rubber cable. These figures are about three inches tall. Also I forgot to put on his gloves. Compared to Ray and Winston, Peter Venkman is a bit of a letdown. He comes with the standard proton pack and P.K.E. meter. Venkman, ya basic. I posed him sitting down, because it seemed like something Peter might do. Though if you look closely, there’s a little bit of character in the nose-less face. They eyebrows have a sort of rogue-ish flair to them. There’s only so much one can do with a Playmobil face. They save the details for the equipment. Always want to put these on upside-down. Finally, we have Egon. Poor, blurry-photograph Egon. Harold Ramis’ scientist has two things going for him. First off, he’s dripping with goo. Why is he dripping with goo? We’ve got a guy with a goo gun several phots up, use your imagination. I am having him hold his proton pack the wrong way, because he’s dangerous. And second is the hair. What a magnificent mane. 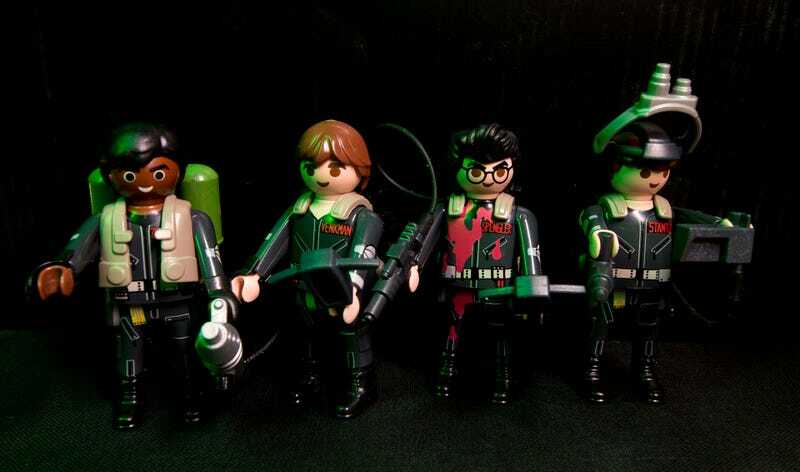 Playmobil’s Ghostbusters II figures will hit stores early next month for $11 a pop. And if the animated version is more up your alley, Playmobil’s got The Real Ghostbusters sets coming in April.